I am pleased to welcome you to my website. The digital project studio in the nice Elstertal stands for competent support in all matters relating to the production of electronic music and the creation of professional websites and print media. Ranging from simple mix CDs for DJ promotion, over the consulting in online & print marketing to professional production of your tracks with cover, booklet creation, and promotional material. Bluecube combines precise craftsmanship with the latest technology for highest performances. BLUE CUBE was founded in late 2007 and has found its seat in Berga / Elster. Manfred Fischer had put his attention to the publication of club-oriented, heavy-electro tracks and ambient music. The idea was to cover two completely different styles of music, that artists have opportunities to develop yourself in a productive environment. For the production of these tracks he mainly use the small project-studio, which is specialize in creation of powerful and melodic club tracks. He is happy to answer requests from external artists and his door is open to every interested. The pleasant and familiar atmosphere offer the best conditions for creative work. 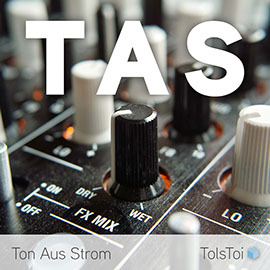 TolsToi - All from one source! Manfred Fischer, who stands behind the synonym Tolstoi, began his career as a DJ, early 2000. But it was him already clear that he wanted to include more sounds and editing options in his sets. Some performances, he played with a colleague from Leipzig as Live Act "Electric Servants " in which they cruised a traditional DJ setup with live played synthesizers & drum machines . In the year 2008, he decided to separate of DJ-ing and producing. He created an analog studio and put the entire force in the emergence of club -oriented electro tracks. In 2011, he remembered back to his roots of his creativity and created a very small but very high-quality digital setup, which can be used both for live performances and for DJ bookings . The tracks are created 100% digitally and with this small setup is he very mobile and can compose anywhere, mix tracks or master these. In 2014 he build his new little studio and produce now his tracks digital with some analogue equipment for a nicer special flavour. This single has been inspired by the feeling that you have when you come back home after a very busy night. In the last few days and months some new equipment arrived my studio... t.c. electronic "flashback", "corona" & "alter ego" and KORG volca "beats", "bass", "keys" & "sample" to complete my DJing and producing Setup... and it works perfectly !!! And one of my new favorite pieces is the Korg SQ-1 Sequenzer fresh from the NAMM Show in Anaheim.